If you want quicker or more profound results in photorejuvenation, or you have such severe damage that you may have precancerous cells or actinic keratosis, photodynamic therapy (PDT) would be a good choice. Dr. Amy Forman Taub, the founder of Advanced Dermatology, is a pioneer and international leader in researching, improving, and applying PDT to skin conditions. 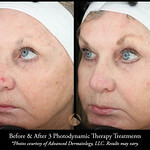 Since “photo” means light and “dynamic” means action, photodynamic therapy is the use of light or laser energy to act against skin disease, in this case sun damage, precancerous cells (actinic keratosis), acne, and inflammatory rosacea. Your affected skin must first be coated with a prescription solution called Levulan, which makes the target cells or glands more sensitive to light. The combination of Levulan and light not only treats the diseased skin cells or glands, it also makes your skin more healthy, smooth, and clear, possibly even prevent skin cancer. How do I know if I need PDT? PDT may be right for you if you have sun-damaged skin, actinic keratosis, acne, inflammatory rosacea, hidradenitis suppurativa, or other less common skin disease. You must also understand the benefits and limitations of this treatment. Pregnant women or patients taking Accutane during the previous six months are not eligible for PDT. 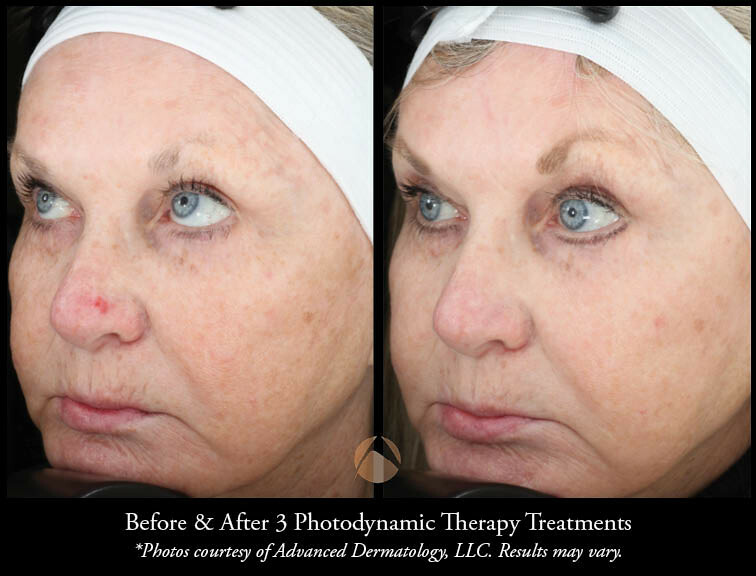 Photodynamic therapy is uses light or laser energy to act against skin disease, sun damage, precancerous cells (actinic keratosis), acne, and inflammatory rosacea. PDT is not painful, you may feel slight discomfort during treatment; it feels like a rubber band snapping on your skin. You can expect relief from the conditions mentioned above in most cases, as well as considerably more luminous skin. PDT is approved by the FDA for the treatment of actinic keratosis, which is considered precancerous. When PDT is used to treat actinic keratosis, more than 80% of patients respond after 1 to 2 treatments, one month apart. Skin lesions (“spots”) that remain require treatment by another procedure or biopsy specimens may be taken. When treating actinic keratosis by PDT, your provider covers the entire area of your skin rather than just the individual spots. This is to remove spots that are too small to be seen with the naked eye. It also prevents those tiny spots from growing and becoming cancerous. We recommend one treatment each year to maintain protection. Also treated by PDT, hidradenitis suppurativa, a severe form of acne, requires monthly treatments until the condition is under control. Maintenance treatments are then recommended. 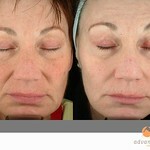 See Acne Procedures for more details on the use of PDT for the treatment of acne. 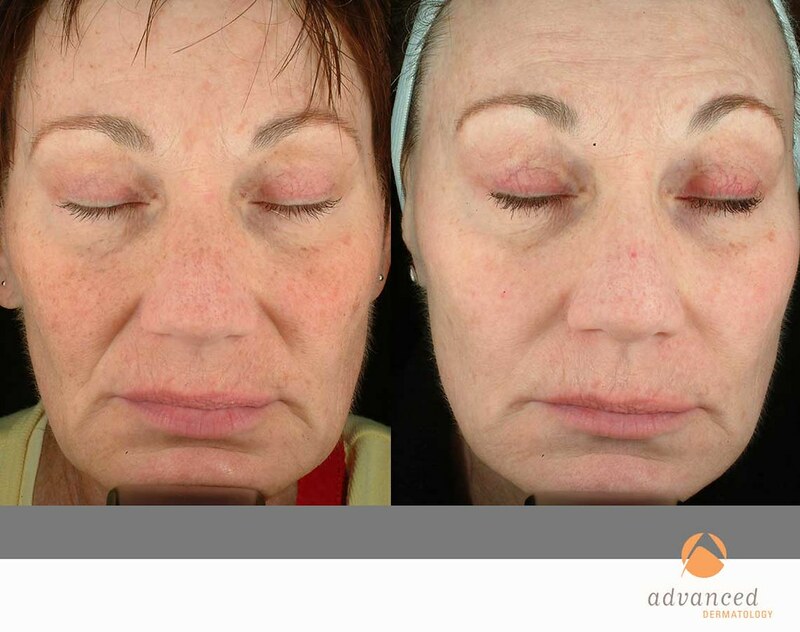 This treatment often results in redness and scaliness, similar to having a sunburn for 1 day to over a week. If there is a lot of sun damage or if you have been in the light during the 2 days, you may have some significant burning discomfort in the treated area. This occasionally happens despite your best efforts. The good news is that even with severe side effects, there has never been any reported scarring with this treatment. So even if you do have a pronounced effect in the short term, you will still get a very good result. If your treated area is tanned or recently exposed to the sun, we recommend that you wait until the tan fades before PDT. This will reduce side effects such as blisters or crusts. If you prefer to have your tanned skin treated, we will reduce the intensity of treatment. How will I feel and look during and after the treatment? On the day of treatment you arrive 60 to 120 minutes early, depending on the area being treated, so your skin can be cleansed and coated with Levulan. For best results, we sometimes also perform microneedling, to increase the absorption of the Levulan. You may want to bring a book to read while Levulan is absorbed by your skin. After 60 to 120 minutes the Levulan will be washed off. The next step is treatment with either a light or laser. If blue light is used you will sit under the light for 10 to 20 minutes. If a laser is used your provider will rub a cool gel onto your skin before treatment. Right after light or laser treatment your provider will apply sunscreen to the treated area. Your skin will be highly sensitive to light, so you must avoid sunlight COMPLETELY for 48 hours after treatment. Wear a hat and sunglasses and lower your visor as you drive home. If you are a passenger, make sure the treated skin is completely covered or turned away from the window. Window glass does transmit light that can activate Levulan, which remains active in the skin for 36-48 hours. It’s very important that you follow your provider’s instructions for after-treatment care. Sunscreen should be applied immediately to the treated area or the area should be covered with clothing, hats, or scarves for the next 48 hours. Do not expose the area to sunlight even briefly during this time. Even though you follow these instructions carefully, you may experience redness, peeling, or both. You may resume your normal skin care after the peeling stops or 48 hours after treatment unless otherwise directed by your provider. Make-up may be applied at any time after the first 24 hours. Yes. Precancerous cells may also be destroyed by topical creams, liquid nitrogen, and surgery. 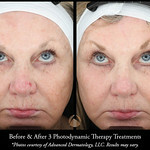 Sun-damaged skin may also be treated by the Fraxel laser, chemical peels, topical creams, and by laser without Levulan. Topical creams and PDT each result in 80% to 90% improvement in actinic keratosis. PDT is done during one visit to the physician’s office, whereas topical creams must be applied daily by the patient for weeks. After PDT the patient appears red and scaly for a few days compared to 3 to 6 weeks with topical therapy. Although uncomfortable for a few minutes, freezing with liquid nitrogen is fast and effective and can be done in a single visit. It’s also simpler than a PDT procedure and less messy than creams. Freezing with liquid nitrogen may also leave a white scar. A major advantage of PDT is that it destroys tiny precancerous cells not visible to the naked eye. None of the other procedures do this. For hidradenitis suppurativa, PDT works better than most other treatments. You also avoid having to lance swollen areas; this is uncomfortable and leaves scars. Yes. PDT may be combined with traditional Photorejuvenation, chemical peels, and other therapies. The choice of combinations depends on the skin condition being treated. It also may be combined with tissue tightening treatments or injectable fillers and toxins. What is the cost of Photodynamic Therapy? The cost depends on the number of treatments. PDT for actinic keratosis may be covered by your insurance if we only use blue light (see PDT under medical treatments) Treatments of acne, rosacea, and sun damage are not covered by insurance and are considered cosmetic treatments that you are responsible for. 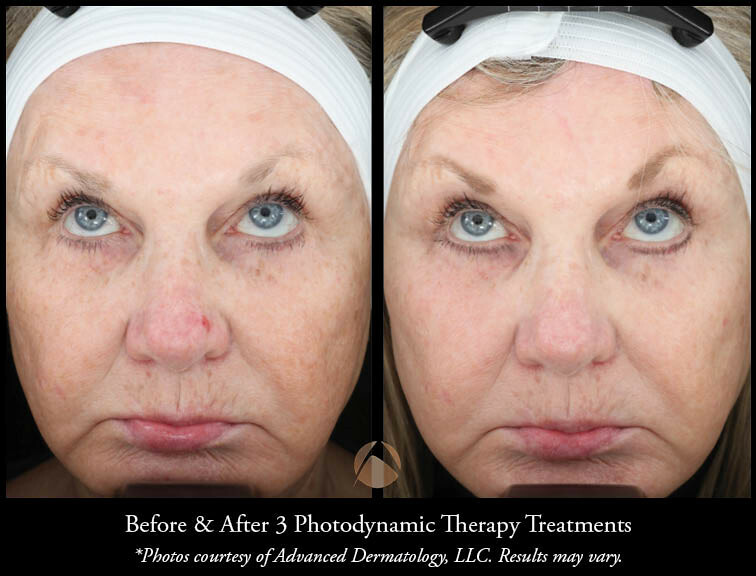 To learn more about Photodynamic Therapy, please call 847-459-6400 or contact us to make an appointment with one of our cosmetic coordinators.